In 1846 Governor Grey requested a military force from Britain, as he was concerned about the ‘unrest’ between Māori and the early settlers in New Zealand. The English Parliament sent a detachment of retired soldiers, ‘The Royal New Zealand Fencible Corps.’ ‘Fencible’ means ‘capable of defending.' The idea was to establish settler townships that could rapidly mobilise as military forces if needed. Onehunga was actually the first Fencible township, and it was far from ready for the ex-soldiers and their families when they arrived. The Ramillies, which had sailed from Tilbury Port in the UK on 14 April 1847, anchored in Auckland on 5 August 1847. On board were 67 ‘pensioners,’ 57 women and 123 children. They spent the next four months in Albert Barracks whilst temporary accommodations were constructed in Onehunga. These were simply two hundred-foot-long sheds, rather than the promised cottages, which would take another year to be constructed. Meanwhile, two more Fencible ships, the Minerva and Sir Robert Sale, had arrived in Auckland. There were now 824 people living on-board ship or in the barracks. It was not until 17 November 1847 that the families from the Ramillies walked the eleven kilometres to Onehunga, carrying their possessions with them. One condition of being a Fencible was that the ex-soldiers should muster every Sunday for Church parade. The Anglicans would march to their Church Service and the Catholics to Mass. On Sunday 21 November, the first Mass was celebrated in Onehunga by Fr Antoine Séon SM. Séon was one of the first 20 Marists who had made vows in 1836. He had been in New Zealand since 1841 and had been working among Māori, mainly in the Waikato region, from a base at Matamata. In 1847, Bishop Viard, then coadjutor to Pompallier, appointed him as chaplain to the Fencible settlement at Onehunga. Judging by the baptismal registers, Séon managed to minister to both Māori and settler communities around the coast and on Waiheke Island during the next three years, until he went with Bishop Viard in 1850 to the newly-formed diocese of Wellington. Not all Catholics in New Zealand, then or now, attended Mass every Sunday. The Fencibles were required to attend Church parade every Sunday. It was the army’s way of ensuring that their retired soldiers were where they had been put, and were still available for defence if needed. Every Sunday the men were mustered, the Methodists marched off to chapel, the Anglicans and Catholics to their respective churches. Naturally, their families worshipped with them. The Fencibles added approximately 1200 persons to Pompallier’s Sunday Mass count! It would be a good thing to explain (without imposing it as an obligation) to the more fervent and intelligent converts, in the familiar conversation that one takes care to have with them – it would be a good thing, I say, to make known to them and through them the people generally (everywhere things are repeated at home and oral tradition is so powerful) the practice of charity or the Kingdom of God among Christians of every country. Everywhere the faithful practise corporal charity, uniting their efforts under the direction of their pastors. Each person gives according to his means in goods or in kind; and in the unity of their common effort they find a way to build their churches, their presbyteries, their schools, their orphanages and hospitals, to maintain their pastors and make donations in their lifetime or after their death to one of the foundations of charity and religion. You can well speak to them of the white Catholics of Auckland, Onehunga, Panmure, Otahuhu and Howick, suburban towns. They have done, or are doing, all that I have written above, according to their means. Part of the arrangement with Governor Grey was for the Catholic Church to have some land in the new settlement: ‘one acre of land for a church and parsonage, with the right to purchase 4 acres as a glebe’ (a church farm). 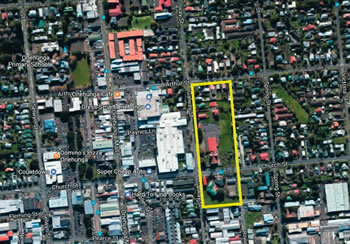 According to the official list of the Crown Land grants at Onehunga, Pompallier and Séon took full advantage of this, acquiring six one-acre plots side-by-side, running along what is now Galway Street. Father Séon devoted his sermon at that first Mass to the desirability of putting in hand without delay the erection of a suitable building to serve as a church and also as a school. He made it plain to the congregation that the project would be entirely in their control, both as to the furnishing and the necessary finance and labour involved. He asked the people to pledge themselves to find the amount of money required to erect a building, which he undertook to ask [Bishop Pompallier] to consecrate as soon as the walls and the roof were able to keep out the weather. Meetings of as many of the congregation as could conveniently attend were held weekly during the next two months, i.e. December 1847 and January 1848. Séon, like Garin, seems to have worked closely with the sergeants of the Fencibles. Trustees of the Onehunga Parish, listed on the Land Grant document, are Patrick Kelly and William Cassin (the great-grandfather of Leo Cassin, one of our readers). They probably also served on the building committee for the first church to be erected. The school took its first pupils in 1848 under Fr Séon, but it was Fr Clery, the diocesan priest who succeeded him as parish priest, who opened the first St Mary’s Church in Onehunga in 1851. Father James Paul succeeded Father Clery in 1858 and he organised the building of the yet larger replacement church, St Mary of the Assumption, which opened in 1889. When we gather for worship today, the land we are on, the buildings we are in, are the result of considerable effort and sacrifice by our forebears in the faith in New Zealand.